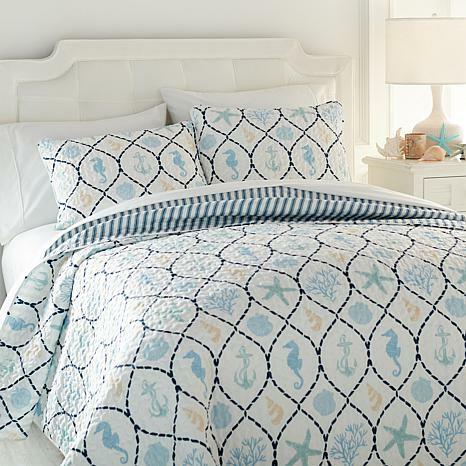 Buoy your room with a happy-feeling print that encompasses everything you love about the sea. 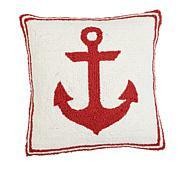 Digitally printed rope creates a classic ogee pattern to highlight the sea creatures and symbols within the spaces. 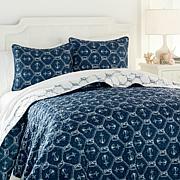 In the delicate colors of sun, sand and sky, this quilt blows a bright breeze of salty air through your space. 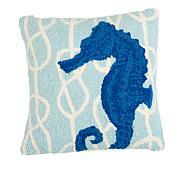 I got this for my daybed & I just love the little seahorses & other sea life in the pattern...so restful and charming. The material is soft & comforting. Very happy with this purchase. So gorgeous and unique and lightweight. So worth it. Everyone who has stayed in the guestroom goes crazy over it. So happy.